"I could not find a good upside down pineapple cake so I made this up. This cake is so moist it needs no icing. It's great, especially for breakfast! " Preheat oven to 350 degrees F (175 degrees C). Grease two 8 inch round cake pans. Prepare cake mix according to package directions, replacing the water with reserved pineapple juice. In a bowl, cream together the butter, brown sugar and cinnamon. Stir in the pineapple and nuts. Divide the pineapple mixture evenly between the prepared pans, then cover each pineapple layer with the cake mix batter. Bake in the preheated oven for 25 minutes, or until a toothpick inserted into the center of the cake comes out clean. Cool cakes for 5 minutes, then turn one layer out onto a plate scraping off any pineapple that may be stuck. Next, invert second cake layer onto the first so there is pineapple in the middle and on top of the cake. May be served warm with whipped cream, if desired. Very moist. I used a bundt pan & used a 15oz can of pineapple. Next time I'm going to try 1 tsp of cinnamon because we couldn't taste it. 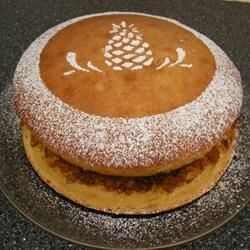 This is the best pineapple cake ever! I can't tell you how many I made and handed out as gifts. To "kick it up a notch" I added orange marmalade to the cake batter. It gives it a zing. I made this cake for my husbands birthday and he and our guests loved this cake. They even asked me to make it again. It was delicious and easy to make.